"Second International Intensive Sanskrit Summer Retreat"
Last year in July, the Department of Indo-European Studies of Eötvös Loránd University, Budapest organised the First International Intensive Sanskrit Summer Retreat in Romania. 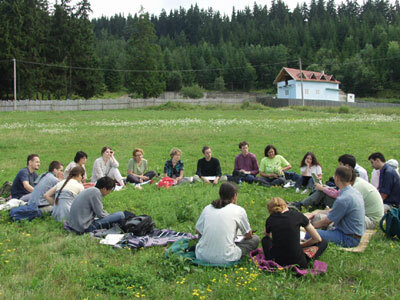 Twenty students and scholars from Hungary, Romania, France, England, the Netherlands, Japan, Germany, and Poland met together in the small Transylvanian market town of Csikszereda (Miercurea Ciuc) for two rewarding weeks of intensive reading of Classical Sanskrit texts from three genres : kâvya, tantra and sâstra. Following the popular success of last year's venture, the Pondicherry Centre of the EFEO will be hosting the sequel : the Second International Intensive Sanskrit Summer Retreat (21st July to 4th August 2003). As last year, 3 readings sessions will take place each day, devoted to kâvya, tantra and sâstra. Each of the texts chosen is one of which manuscripts have been gathered and collated by a participant of the Retreat. Original organisers: Dr. Imre Bangha (Oriental Institute, Oxford), Dr. Mária Négyesi and Csaba Dezso (Eötvös Loránd University, Budapest).